In January 1916, Seattle’s Coliseum Theatre opened with legends attached. 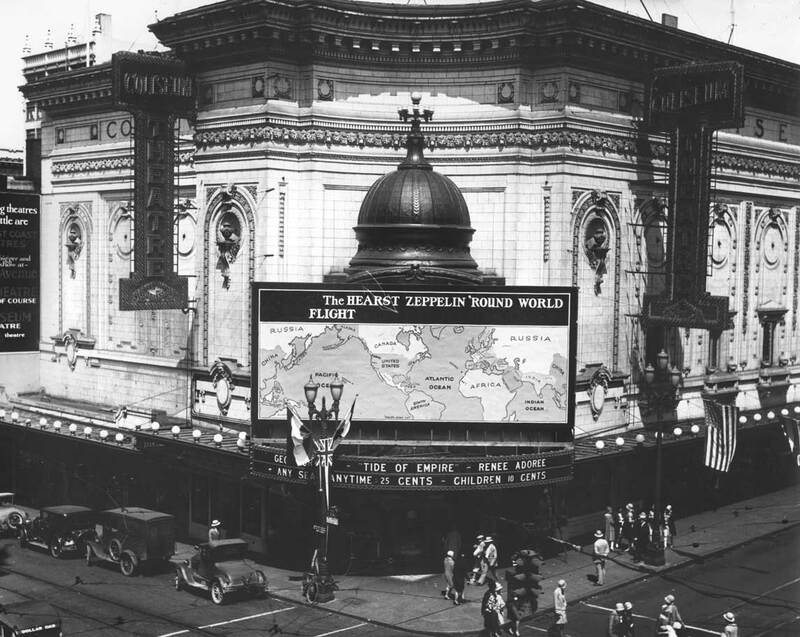 It scarcely mattered that the stage was a bit small for the largest of vaudeville acts for it was claimed to be the largest and most lavish of theatres built not for stage acts but for films. As the legend matured it was also the first. B. Marcus Priteca, Seattle’s famed architect of theatres, designed it for one of that time’s more flamboyant developers, Joseph Gottstein. The neo-classical temple that Priteca concocted was of such flash that the facets of its glazed white terra cotta façade were designed with the help of sciography: the study of sun angles. At night inset electric bulbs threw their own shadows. The lavish appointments continued inside with, by one report, “a symphony of upholstering,” which did not, however, dampen acoustics that were considered the best in Seattle – perhaps in the world! The theatre orchestra of eight players, plus a “giant Moller Pipe Organ”, were all Russians, again, the “highest paid in the U.S.” Fountains framed the orchestra pit and songbirds in wicker cages accompanied the players. By one count there were thirty canaries — probably the best fed in the nation. High above, the Big Dipper twinkled from the ceiling. 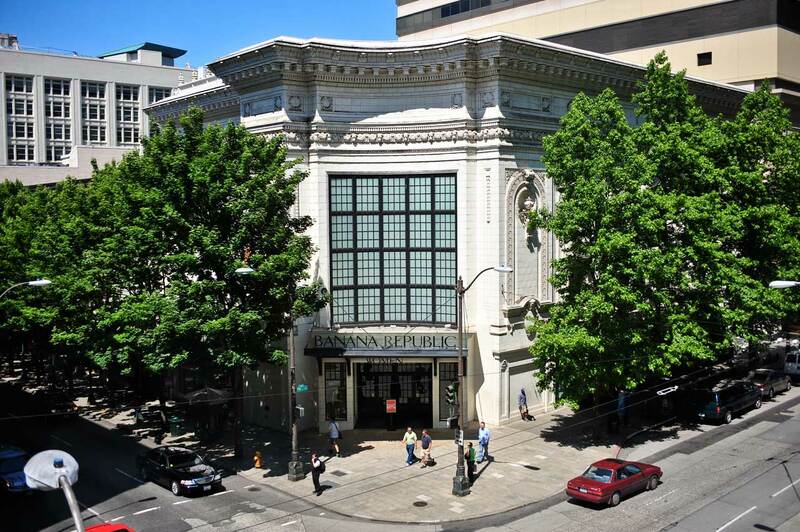 Jean Sherrard took the “now” from the third floor of the Washington Federal Savings Bank, kitty-corner to the Banana Republic, which in a local example of “adaptive reuse” arranged the landmark Coliseum Theatre for selling clothes and such in 1994, four years after the theatre went dark.